Chinese smartphone maker Huawei aims to become the world's largest smartphone maker by 2021, ahead of both Apple and Samsung, and the latest market share data suggests it continues to make progress towards that goal. Huawei shipped an estimated 38.4 million smartphones in the June quarter, a 20 percent increase over a year ago, according to research firm Strategy Analytics. By comparison, Apple reported it sold 41 million iPhones in the same period, up nearly 2 percent from 40.4 million iPhones in the year-ago quarter. Huawei's market share rose to an estimated 10.7 percent in the quarter, putting the Chinese company well within striking distance of Apple's estimated 11.4 percent market share in the quarter. 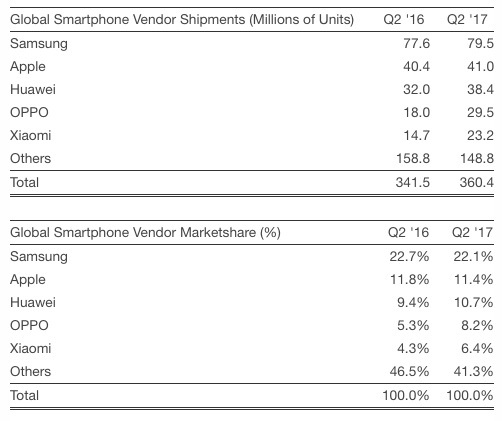 Samsung continued to lead the market with a 22.1 percent share of shipments, according to Strategy Analytics. "Huawei is now closing in fast on Apple and Apple will be looking nervously over its shoulder in the next few quarters," said Woody Oh, Director at Strategy Analytics. "Huawei is outperforming across Asia, Europe and Africa with popular Android models such as the P10 and Mate 9." Beyond the iPhone sales numbers, officially reported by Apple, it is important to acknowledge that these are estimated figures, and shipments within distribution channels do not necessarily reflect sales to customers. Apple also captures the vast majority of profits in the smartphone industry. Since 2011, the worldwide smartphone market has been dominated by Apple and Samsung. The elusive third-best spot, meanwhile, has failed to be held down by one vendor for an extended period of time, changing hands between Nokia, BlackBerry, Xiaomi, and Huawei over the past six years. In 2014, it looked like low-priced Chinese vendor Xiaomi had firmly cemented its position as the world's third-largest smartphone maker, but due to a limited retail presence and declining popularity, Huawei is now firmly in the driver's seat. Huawei has been making an aggressive push into several European markets, and it's even testing the North American market after launching its smartphones in Canada in June. Huawei isn't well known in the United States, however, largely because it lacks agreements with Verizon, AT&T, T-Mobile, and Sprint. American customers have to resort to retailers such as Best Buy or Walmart, or Huawei's direct sales website, to purchase one of their unlocked smartphones, reducing the brand's visibility in a country where Apple and Samsung reign supreme. If Huawei can find success in Canada, then perhaps it will consider tackling the much larger market south of the border next. Apple reported revenue of $8 billion in Greater China in the June quarter, a 10 percent decrease compared to the year-ago quarter, and some analysts believe that's partly due to the iPhone's declining popularity in the country. iPhone market share in China fell to 9 percent in the first six months of 2017, from a peak of 14 percent in 2015, according to Counterpoint Research. iPhone was only the fifth best selling smartphone in China during the June quarter, behind other Chinese rivals like Oppo and Xiaomi, research firm Canalys said. Apple CEO Tim Cook didn't have much to say on iPhone in China during its post-earnings conference call on Tuesday, but he did comment on the growing popularity of messaging app WeChat, developed by Tencent, in the country. "In terms of WeChat, the way I look at this is, because iOS share is not nearly a majority of the market in China, the fact that a lot of people use that… it makes the switching opportunity even greater," said Cook. "I think that's more the case than the risk that a lot of folks have pointed out." "I see Tencent as one of our biggest and best developers," added Cook, who remains optimistic about China. "They have done a great job of implementing iOS features into their apps, and we are looking forward to working with then even more to build even greater experiences for our mutual users in China." The focus now shifts to the fall, when both Apple and Huawei are expected to unveil new flagship smartphones. 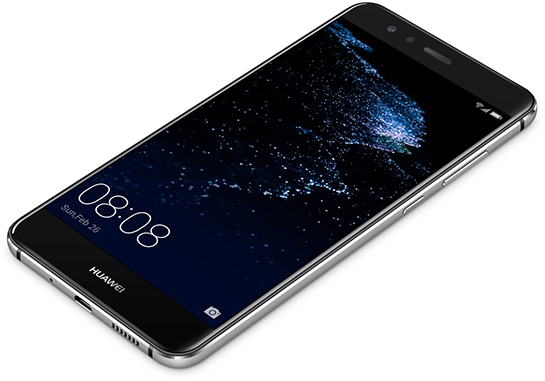 Huawei reportedly said its upcoming Mate 10 handset will be able to compete better than ever with the so-called iPhone 8. Design of various Android phones is nicer. But Apple rules with iOS, much higher quality, and by far the best service. What’s the ASP of Huawei phones? Oh, you don’t say, don’t you? And what happens if one brand or another gets caught in a problem like defective exploding batteries (happened with Samsung, can happen with anyone), how much phones Apple will need to replace, and Huawei, do they have money for that liability? And Android? With ALL THAT HUMOUNGOUS marketshare, what is happening with captivating developers? With Mac vs Windows, Apple struggled and still struggles because there weren’t enough software for Mac (eg games, CAD software, etc. ), but with mobile, AppAnnie just announced that the AppStore went from +90% of developer revenue than the PlayStore to now +95%. Ahhh so they SHIPPED 38M, versus what Apple SOLD. Gotchya! Regardless of what Huawei does -- the news for Apple is this: revenue is down in China, while the China market grows. Not a great sign after so much effort being exerted to penetrate the Chinese market. As much as a lot of us like the idea of the total ecosystem that Apple brings to the device, for a lot of people the spec sheet speaks louder, especially if the price is lower. In places where WhatsApp is probably central for messaging even Facetime (something that locks people to iOS in the States) doesn't really draw you to Apple. Shipped and sold means the same thing in these reports. Apple, like most everyone else (*), reports a sale when a unit is shipped to a retailer. So when you read that Apple sold 40 million iPhones, it does not mean they were all sold to end users. Most were sold to retailers. And some quarters, millions of those go unsold until the next quarter. (*) Samsung reports the sale AFTER the unit arrives at a retailer. By reporting earlier, at time of shipping, Apple can publicize bigger sales numbers during opening weekends while millions of units are still on the way to stores. Apple has the edge on brand recognition but Huawei has better design, quality and value that's why the local Chinese phones are outselling the foreign Chinese phones like iPhones. Better design and quality? Where's Huawei's OS? Where's Huawei's custom SoCs? You can't omit those things from design and quality considerations. Huawei doesn't even attempt to include them. Market is consolidating. I think Huawei is eating Chinese competitors first. Being "Top"means nothing. But "Best"means everything. :apple: iPhone is not for everyone, it's for those who want the best. There is nothing special about any Android brand that might retain repeat customers. The Blu phone has spyware on it as it war reported many times as well as the others Crooked Amazon was selling it knowing, it all from the same source. If you want to sell you tech in commie china you must share it with us, that really means let them steal it. I see no innovation here. How much did they pay to have this posted here? China is not a communist country, last time I asked you do look up what communist means, china is far from a communist country.